Can't bring your road bike on your trip to Boston? Rent a high-end road bike when you get to Boston! If you want to ride longer miles, keep a higher speed, have a more aggressive riding position, or ride in a race, a road bike would be a perfect fit for you! Explore the winding colonial streets of Boston on your own time with this 24-hour Boston bike rental. 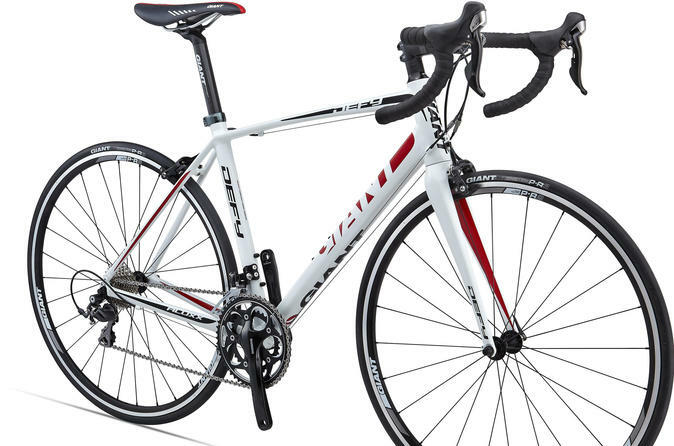 Hop on an aluminum road bike and set out on the town or beyond. The pickup location across the street from Christopher Columbus Waterfront Park puts you at the footsteps of the North End, several of Boston’s picturesque wharfs and more. Within minutes, you can be pedaling past the stately brownstones in Beacon Hill or riding around the Boston Common. Your bike rental will include a lock, helmet, flat-tire kit, and lights upon request. *In times of high demand, your rental may be substituted by a bike of a different brand (Masi or Kona) for the Giant Defy. The bike provided will be otherwise identical in specifications.